Having a garden is all about leisure. Gardening is an excellent hobby that helps you relax. Seeing that well-maintained lawn and manicured plants is a delight to the eyes. Definitely, your family and you would spend considerable money, time and effort on maintaining the garden. But have you ever considered actually making money from your garden? Possibly not yet. There are excellent proven and legit ways to make money from your garden that you can try. It will help make extra money for the household and of course, for improving your garden too. 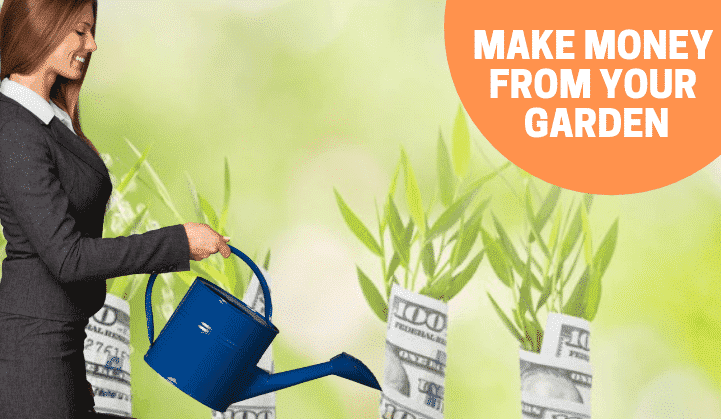 If this interests you, here are 12 proven and legit ways on how to make money from your garden. Before you think of making money from your garden, there are some important basic requirements. The garden should be fairly large. You should have an excellent collection of flowering herbs and plants. Weeds, dangerous reptiles, termites and other pests should be kept at bay. Your garden should not be cluttered with plants, herbs and trees. It should be safe for children to play. Understandably, you would meet some of all of these basic requirements. If so, read about how to start making money from your garden almost immediately. Your garden offers ample opportunities to make money. Here we explore some of them. These money making ways do not require any serious or tiresome efforts. If you have great flowering and fruit-bearing herbs, sell their seeds. You will need some knowledge about how to select the right seeds that will germinate and sprout. Also, it is important to package them properly while ensuring there is no damage. Make sure that the seeds you sell are allowed by law. You can inquire at a nearby seed library for details. Some seeds cannot be sold outside certain American states. Also, selling seeds of foreign plants are not permitted since they can alter the ecosystem. Selling cut flowers directly from your garden or to a nearby florist is another great way of ensuring regular income. Find out how much does a bunch of flowers of any particular variety cost in the market. A florist will buy them at slightly lower prices. You can also invite people to your garden to select and cut flowers of their choice. This also adds a personal touch to the cut flower business and ensures better profits. Additionally, it prevents the waste of flowers since you not several in anticipation of buyers. Edible mushrooms of all sorts command a high price in the retail market. They are easy to grow. And they grow pretty fast too. To grow edible mushrooms, it is necessary to buy their spores from a good store. Depending on your location, you may have to set up an inexpensive greenhouse in your garden. Rare edible mushrooms sell at very high rates. This is because of their higher nutritional and medicinal properties. You can easily buy their spores online. But once again, it is necessary to find whether a particular variety of edible mushrooms is permitted by law. Since mushrooms grow very fast, uncontrolled breeding can play havoc with your garden. If you have a larger garden, rent it out to families and companies for picnics and parties. You can make extra money by renting out garden furniture too. Or offer a full package that includes the space with furniture, BBQ and other appliances where possible. Lots of companies and business groups love to host outdoor parties, especially in the evenings. They do not want that typical hotel or resort ambience and look for something more homely. You can advertise your garden as a party venue online on a website such as Craigslist. Pictures of flowers, herbs, plants and nature are in great demand among nature lovers, advertising companies and website owners. Take some great pictures that speak volumes about nature. For example, flowers with morning dew appear very attractive in pictures. You can earn more money if you have rare flowers in your garden. Visit any online stock photo portal and browse pictures about flowers they have. It will give you an excellent idea of what pictures to take and how much money you can make through their sale. Also, open an account on a stock photos website to sell these pictures. For those adept at gardening, starting a blog is a good way of making money from your garden. You can write about your experiences with gardening, use of soil, irrigation techniques, fertilizers and share loads of information about growing various plants, herbs and trees. Use excellent pictures of your gardening activities on the blog to highlight your writing. Blogging is the surest way to make money from your garden. You can open a free blog or buy a domain name, website hosting and other essentials to launch a very sophisticated and professional blog. Herbal medicine is nothing new. It has only shot into limelight in recent years due to the onslaught of Ayurvedic medical companies from India hammering the American and foreign markets. With some online research, you can discover that herbs like Rosemary, Thyme, Rhubarb and other common herbs have excellent medicinal properties. Grow medicinal herbs and plants. Varieties used in making herbal cosmetics, beauty products and healthy beverages. You can also cut and dry medicinal roots, leaves, flowers, fruits and seeds for sale. They fetch a good price depending on the variety and cultivar. Companies and laboratories that develop hybrid varieties of fruits, vegetables and other plants want to test them in real life conditions instead of controlled atmosphere. They are willing to pay some money to anyone that offers the service. You can register with one or more product testing websites as seed tester. Grow their sample seeds in your garden to make money. The process is slightly more complex than merely growing seeds: you may have to follow instructions provided by the company. In any case, you will have to write a review of the methods you use to grow the seeds. This information has to be precise and verifiable and contain your personal experience. The next time you mow a lawn or clear your garden of leaves, flowers and fruits, dump it in a composter. You can also use fruit and vegetable peelings, discarded food and other perishable stuff that decomposes over time. These can be converted into excellent compost fertilizer for gardens. Make and sell compost from your garden. It saves neighbours and those looking for organic fertilizers a lot of hassle and money. You might need some bags to package and sell fresh compost from your garden. The only other investment is a composter, which can be rigged up easily at home using discarded stuff. Selling a bit of extra soil from your garden is an excellent way to make money. People with gardens will readily buy potting soil from you for a couple of reasons. Firstly, since it comes from your own garden, it would contain the right amount of fertilizer and moisture as it is used for your own plants too. Secondly, they need not buy a sack load if you offer smaller quantities. You can make packets of potting soil for sale and advertise online. Or you can simply spread the word around your neighbourhood that you are selling potting soil. This is another great way to make money from your garden provided you have tended to the soil personally and in the proper way. Good at gardening? Start gardening classes to teach other people about your tricks, tweaks and techniques. You will be surprised at the number of people who own a garden but have no clue on how to develop or maintain one. These people will readily sign up for any good class. You can engage them in gardening activities in your own garden and make money. Alternatively, you can start a video blog or vlog by opening a free channel on YouTube. Take excellent Do-It-Yourself videos while you are gardening and give detailed commentaries about what you are doing. A YouTube channel also helps you make money from your garden. Google, the parent company of YouTube pays you for displaying ads before, between and after your videos, when you subscribe for the free Google AdSense. You also make money if any viewer clicks on ads displayed alongside your videos. Small and large businesses look for garden owners who will rent them space to display signboards and advertisements. At some locations, you may need permission from local authorities or the community to display such signboards. However, renting space from your garden to display signboards is another way to make money. Generally, a business will hire space for limited periods only. Advertising companies, however, reserve a spot for much longer and pay in advance too. Find if local laws allow you to display signboards in your garden. Find prevailing market rates and make offers to advertising companies and local businesses. There are several other ways to make money from your garden such as conducting garden parties and picnics, renting out garden space to people that do not own one and growing gourds and other vegetables. However, these require some extra efforts and initial investments. You can opt for these too if you are looking at making more money from your garden. There is no dearth of ideas of money-spinning ideas by using your garden. Try these simple, tested and proven as well as legit methods to earn that extra money you always wanted.